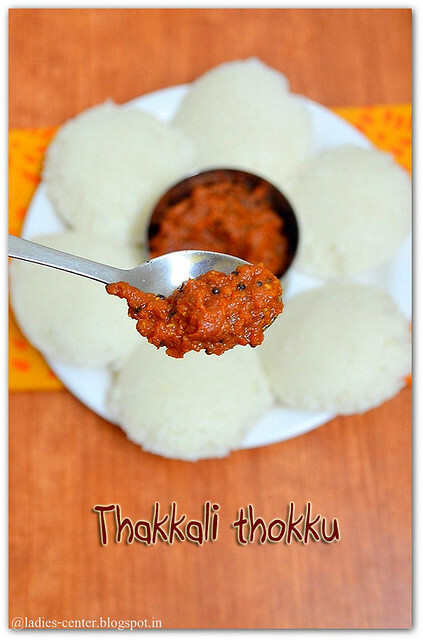 Thakkali thokku is an easy to prepare and tasty accompaniment for idli, dosa, chapathi and even rice. The secret of making a tasty thakkali thokku is to allow it to cook the tomatoes well and come into a thokku consistency. The main ingredient is only tomato. So, it will be a great saver when you do not have coconut at home. About the taste: It has a good tangy taste with mild sweetness. If you want a spicy tomato chutney you can omit the jaggery. Storage suggestion: You can even store it in fridge for many days and use it. Since we are not adding coconut, tomato thokku will not get spoiled easily. Serving suggestion: If you add little gingelly oil while eating, it will be very tasty. Let us see how to make thakkali thokku now. 1. Grind tomatoes, 1 tsp cumin seeds and 1/8 tsp fenugreek seeds(optional) in a mixie. Grind them to a fine paste. No need to add water. Keep it aside. 2. Heat oil in a pan, add mustard seeds. Allow it to splutter. Add urad dal, cumin seeds, curry leaves and hing. Saute till the urad dal turns golden brown color and the cumin seeds crackle. Add the ground tomato paste in the pan. Mix well. 3. Add salt, turmeric powder, red chilli powder and coriander powder. Mix well. It will take more than 5 minutes to get the tomatoes cooked well. You can even cover and cook to fasten up the cooking. But take care not to get the thokku burnt. Stir occasionally. The thokku starts becoming bright red color and reduces in quantity. 4. Once the tomato chutney start turning to thokku consistency(semi solid), add jaggery powder and mix well. Once it attains full thokku consistency well, switch off the stove. 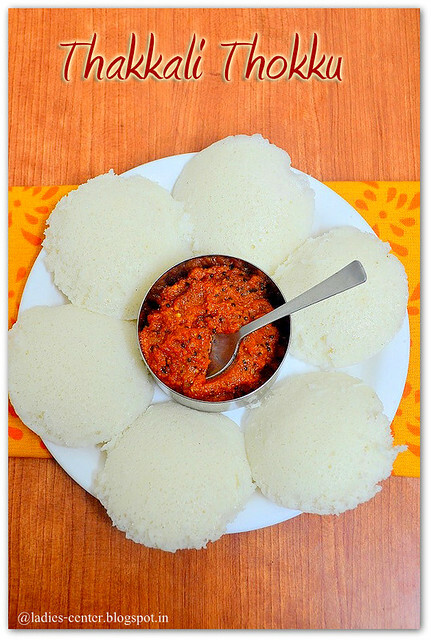 Serve it with idli, dosa or curd rice. 1. If you make thokku from 3 tomatoes, it will be sufficient for only 2 servings. If you want to store it, make it in large amount. 2. Adding jaggery is purely optional. If you like the mild sweetness, you should add it to enjoy the hint of sweetness in each and every spoon. 3. You can add fenugreek powder instead of fenugreek seeds. 4. 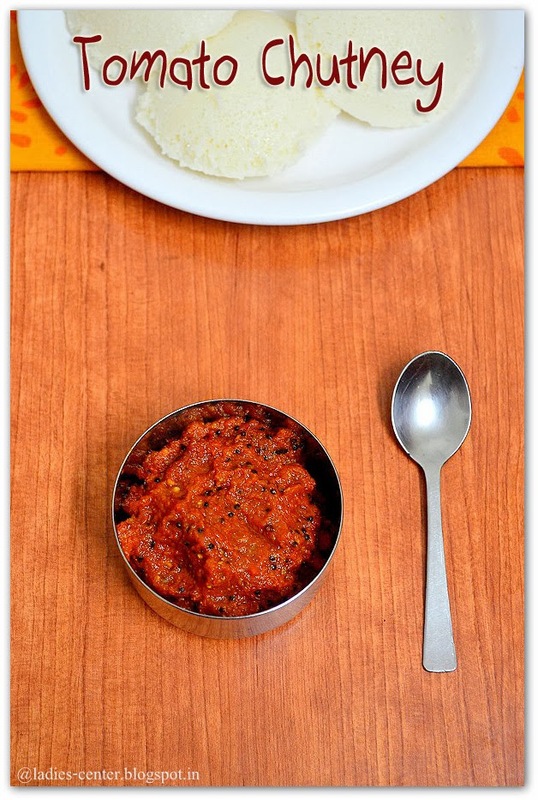 Since the tomato thokku takes some time to get cooked, you might feel to concentrate on other work. Stir occasionally to avoid the thokku get burnt. Hi Esha... Try this.. You can use any vegetable oil for tempering.. Gingelly oil is oil taken from sesame seeds(Til). We do not need to heat it.. We can directly have it with chunteys.. It will enhance the taste.. I do not know why it is not famous all over India.. Even I only introduced it to my north indian neighbor.